The 20′ Delivery Box has a struck capacity of 903 ft³ (25.6 m³) or 1,018 ft³ (28.8 m³) with extension, and requires 300 horse power (224 kW). Unlike any other delivery system on the market, the Supreme International Delivery Box has a revolutionary AUTO FEED FLOOR DRIVE that simplifies feeding on a new level. With a pressure sensing floor that automatically moves based on ration type, the operator no longer has to control the floor speed. This is one less step that the feeder has to accommodate for, and instead only has to focus on opening the discharge door and controlling conveyor speed. The End Dump option is shown in the model picture and the drawing below. 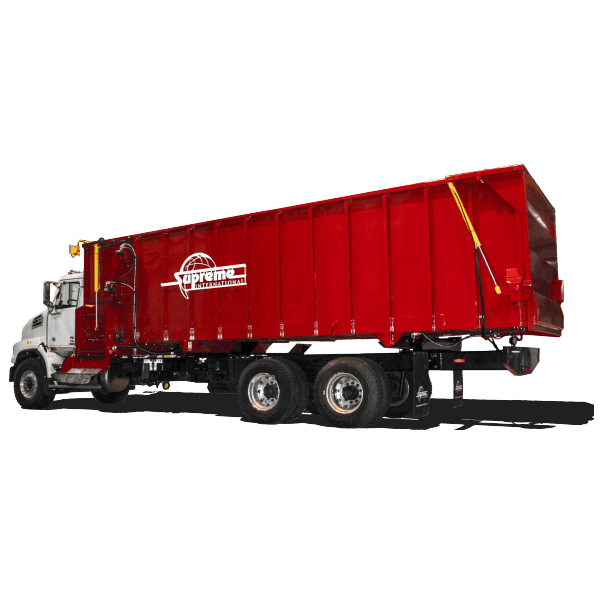 The 24′ Delivery Box has a struck capacity of 1,108 ft³ (31.4 m³) or 1,252 ft³ (35.5 m³) with extension, and requires 300 horse power (224 kW). The 20′ Delivery Box has a struck capacity of 903 ft³ (25.6 m³) or 1,018 ft³ (28.8 m³) with extension, and requires 300 horse power (224 kW). Unlike any other delivery system on the market, the Supreme International Delivery Box has a revolutionary AUTO FEED FLOOR DRIVE that simplifies feeding on a new level. With a pressure sensing floor that automatically moves based on ration type, the operator no longer has to control the floor speed. This is one less step that the feeder has to accommodate for, and instead only has to focus on opening the discharge door and controlling conveyor speed. The End Dump option is shown in the model picture and the drawing below. The 24′ Delivery Box has a struck capacity of 1,108 ft³ (31.4 m³) or 1,252 ft³ (35.5 m³) with extension, and requires 300 horse power (224 kW). Unlike any other delivery system on the market, the Supreme International Delivery Box has a revolutionary AUTO FEED FLOOR DRIVE that simplifies feeding on a new level. With a pressure sensing floor that automatically moves based on ration type, the operator no longer has to control the floor speed. This is one less step that the feeder has to accommodate for, and instead only has to focus on opening the discharge door and controlling conveyor speed. The End Dump option is shown in the model picture and the drawing below.